Captain Sailnator: Hello Shannon and Jon, thank you so much for taking the time for this interview. Just introduce yourself to my readers. Who are you? Shannon: My name is Shannon Walker, I am 28 years old and I grew up in Southern California. I am the first mate aboard Prism. The Captain is Jon Neely, he is 26 years old and grew up in the mountains in central California. Jon and I met in 2009 when he asked me “How would you like to sail around the world?” When we first left California to start our cruising journey my brother Sean joined us for the first 5 months. We also rescued a kitten in Zihuatanejo Mexico, her name is Benita. Captain Sailnator: How did you get the idea to cruise or to live aboard? Shannon: Jon grew up sailing, and the idea of sailing around the world has been a goal for his entire life. I however, never had the notion or thought of ever sailing around the world, let alone to just sail. I grew up spending my weekends on my family’s power boat at Catalina Island, looking at sailing boats and wondering “where do they go when inside?” But when Jon asked if I wanted to sail around the world, I thought why not! Captain Sailnator: Was it a spontaneous idea or a process? Shannon: It started off spontaneous, then turned into a process, a 5 year process to be exact. In the process Jon and I bought a boat, tore that boat apart and rebuilt it for 2 years. We then sailed that boat south, but only made it to Southern California before we decided we wanted a bigger boat. So we bought our 2nd boat, and spent one year fixing her up to go, and away we went. Captain Sailnator: What did your friends and parents say about your plans? Shannon: Most of our friends thought it was a great idea and an adventure of a life time. Family felt the same way, but they were very sad about the long durations without seeing us. Captain Sailnator: What did you do with your house, car, stuff? Shannon: Jon and I bought a boat instead of a house :) When it came time to cast off the lines, we sold our car, and only have a few things in storage. 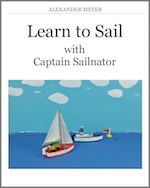 Captain Sailnator: How did you learn to sail? Shannon: Jon grew up sailing, learning everything he knows from his dad. I learned how to play on little boats at summer camp as a kid, but then learned how to sail with Jon as my teacher. We are both learning something new every time we are sailing. Captain Sailnator: How could you afford it? Shannon: Jon and I worked very hard to save anything that we didn’t need to spend to live. Jon is a freelance videographer, and I worked as a bookkeeper to help fill the cruising kitty before we left. When we left we had enough saved to cruise for 2-3 years spending $500 a month. Captain Sailnator: What kind of boat do you have? Shannon: We have a Hans Christian 33t. She is a 1982, is 32.8ft long on paper, but she is about 43ft overall with the bow sprit and windvane off the stern. She has a full keel with a large forefoot cutaway. She drafts 5.5ft and is 11.6 ft wide. Captain Sailnator: Why did you decide to buy just this one! Shannon: Why would anyone not buy this boat!?! The HC33 was our dream boat from the very beginning. 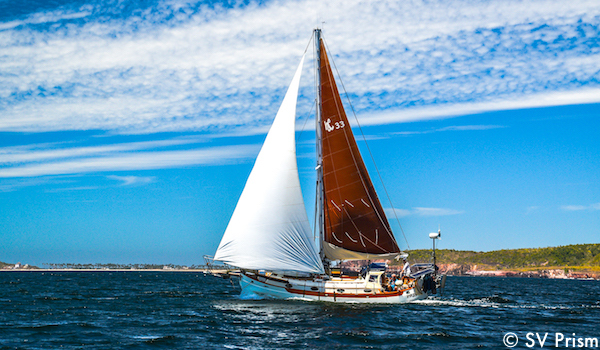 She has the beauty of the classics, enough room inside to feel like a home, and the sailing capabilities to go anywhere and to make you feel safe during passages. And yet it is small enough to single hand if need be. Captain Sailnator: How did you find it? Shannon: We were Always looking on yachtworld.com to see what kind of boats were for sail, and keeping our eyes on the HC33s. When Prism came on the market She was listed for $98,000.00 which was way out of our price range. We watched the price drop over the weeks, and thought why not make an offer, the worst that can happen is they say no. Along with our offer we sent a letter telling the owners a little about ourselves and our dreams to sail around the world. We worried they would flat out say no, But they didn’t say no completely, they said no to our offer, but gave us their absolute bottom dollar price. We jumped on the opportunity right away! 5 days later we packed all our belongings into our Subaru, left our fist boat Tara in the hands of a broker and we made our way up to Olympia Washington. We handed over the cash, got the pink slip and could not get to our new boat. We could see our new home sitting at the OYC dock, but the members of the yacht club would not let us in. They said we needed to have a member sign us in as a guest, so we waited at the door and asked every person who walked in to add us a guest. Not one person would. We had to wait for our broker to get back form a sea trail. So we waited for 6 hours. Captain Sailnator: Did you have the help of an agent or of a surveyor? Shannon: The broker for Prism was a life saver and so helpful. The week before we could get up to the boat, he would go out to the boat and take pictures of items we had questions about. He was very helpful and explained to us all the things we needed to know about sales tax in Washington. The day we did our sea trial we also had the boat hauled and surveyed. The surveyor we used was a joke! We could have done what they did, gotten more information and saved the $500. Captain Sailnator: Which obvious problems did the boat have? Shannon: In the pictures the teak decks looked like they were in very rough shape and would need to be replaced or taken off. Luckily that was not the case and they only needed to be recaulked. Other than that, the boat had been put away correctly and was clean minus the mildew that grows on all boats in the Pacific Northwest. 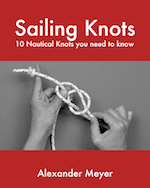 Captain Sailnator: Which hidden problems did you find later by refitting the boat? Shannon: There are 2 major ones that come to mind, first the bowsprit was rotten! That took us by surprise and we were lucky it did not fail on our sail from Washington to San Francisco. Second was the rudder it was filled with water and had a huge crack along the bottom half which we had to cut off and replace with a new fabricated wood piece. Captain Sailnator: What did you repair/replace/change by the refit and how long did it take? Captain Sailnator: What kind of learning curve did you have during the refit? Shannon: Lucky we learned almost everything we needed to while we worked on our first boat Tara. That was a 2 year project that took place in our friends back yard. Where we gutted the 1984, 28 foot caliber and turned her into a 2011 all new pocket cruiser! Captain Sailnator: Did the refit influence the relationship to your partner? Shannon: A major refit is very taxing! At one point during our refit of Tara we had to take a month vacation, 30 days without thinking or looking at the boat, other wise we thought about burning it to the ground. Jon is a very motivated man, who wanted to get out and start cruising ASAP, so when we were not at work making money to pay for our dream, we were working on the boat. Same thing with Prism, it was work work work so we can go play. If it wasn’t for Jon’s push to keep on the boat work, and and we got to go play every weekend with our friends, we would most likely still be tied to the dock and not sitting in Honduras right now. Captain Sailnator: Did you live on the boat during the refit and do you recommend that experience? Shannon: We did both. Depending on the project at hand, we would stay on the boat or stay on Jons family boat. Living on your boat when she is on the hard, is very hard to do and I do not recommend it. I like to have the boat put back together before I climb into bed, and when the boat is in the yard, when you are paying lay days, putting everything away at night just to bring it all back out the next morning is time wasted in Jon’s mind. So to keep us happy and not strangling each other we stay else where while the boat is in major project mode. Captain Sailnator: Was the refit on the expected budjet or was it more expensive? Shannon: You know they say that BOAT stands for “bust out another thousand” I’d have to say that if I didn’t work at a boat yard, the refit would have been way over budget. I’ll say that we spent as much as we needed to get the boat safe and cruise ready. We spent about $20,000.00 on our refit. Boats are expensive and there is really no way to get around that. If you are willing to do hours of research you can find the bargains that will save you a lot of money. You just can’t walk into the closet west marine and refit your boat on any kind of reasonable budget, unless money is growing on trees for you. Captain Sailnator: How much was the boat all in all and how much does it cost to maintain it? Shannon: We bought Prism for $65,000.00 put in about $20,000.00 of upgrades and maintenance, for a total around $90,000.00 to have her ready to go. Yearly we spend about $3000.00 for keeping the boat working and happy. Captain Sailnator: Do you have any advices for sailing on a budjet? Shannon: It’s doable! $500 a month can be hard at times, for us in Mainland Mexico it cost about $1000.00 a month even though we were only trying to spend $500.00 . The biggest draw on a budget are the invites to go out for drinks. But if you make the majority of your meals on board and don’t drink too often, you can stay within any budget. Captain Sailnator: What are you doing for a living? How do you finance cruising/living aboard? Shannon: We saved enough money to cruise for about 2 years with out needing to work, that was in 2014. Now we are making videos for our u-tube channel. We have the support from our Patreons and other fans who donate money every now and then. Captain Sailnator: How did you save money to buy a boat? Shannon: Jon made good money while filming television shows for ABC and Disney, while I did the books for the local boat yard. We also had the money from the sale of our first boat, that we bought for only $4000 and sold for over $20,000. Captain Sailnator: Where have you already been? – What are your future plans? Shannon: We stared in 2013 in the Pacific Northwest and sailed down to San Francisco. We left the bay in October 2014 and headed for Mexico. 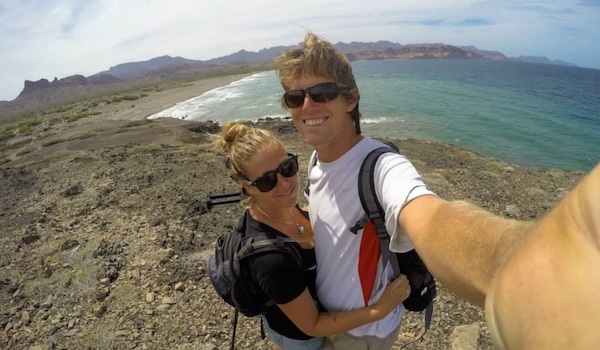 We sailed down the Baja coast for 2 months, rounded into the Sea of Cortez and sailed northward for 5 months. We put Prism on the hard in Guaymas Mexico for 6 months while we went back to the states because of a job offer we could not refuse. ( Jon was offered to be the Director of Photography for a National Geographic documentary about Billy the Kid) Once we got back to our boat in December 2015 we sailed down the mainland of Mexico. We checked out of Mexico in May 2016. Right now we are in Honduras, leaving tomorrow morning (May 21, 2016) and are heading for Costa Rica. We plan on spending a year in Panama, and we are not sure where to go after that. Captain Sailnator: Where do you publish your adventures and your life on board? Captain Sailnator: What is your intension by sharing your life? Shannon: To share the experience. Some people go their whole lives without seeing what the world has to offer. So we are trying to share a little of our adventure for those who can not take one of their own. Captain Sailnator: What is the backside of cruising/living aboard? Shannon: It is not as easy as it looks. Cruising is stressful and a lot of work. At least for what we doing. Yes it is beautiful! And the people you meet are amazing and the different cultures are captivating. However if feels like you are always working or moving. We are on a weather schedule which keeps us moving and the more you move, the more maintenance the boat needs. At times we don’t have enough to time to just sit and enjoy. Plus sailing is not always fair weather sailing, when things get stressful it puts a toll not only on the relationship, but on the boat. Not to mention that when you only have 33 feet around you, there is no room to ignore the other person. Being forced to talk about any issues and annoyances that might be bothering one of us has made our relationship strong, that doesn’t mean we don’t get on each other’s nerves sometimes. Captain Sailnator: Would you do again what you did so far? Captain Sailnator: What would you do different? Shannon: Jon says he would have painted the varnish, and installed more solar panels. I say, I would have started earlier in the season. We had such a late start this season, that we as to rush to get though Mexico to get out of the hurricane zones. Captain Sailnator: What was your worst sailing experience? Shannon: Our very first over night sail. We didn’t know what we know now, and looking back we should have never left when we did. To put it shortly, we were in our 28 foot boat, there was no moon, 40+knots of wind and 16 foot seas at 6 seconds. We got knocked down twice, and had waves breaking in the cockpit. At one point when Jon was strapped in at the mast taking down the main, a wave crashed over the boat and swept his head lamp off. So I thought the sea claimed him. We were about 10 miles off Point Sur in California, I was so sea sick I had no strength,we had no working auto pilot, I truly thought I was going to die. Obviously that didn’t happen and we made it to our destination. A good friend of ours who completed a 12 year circumnavigation, once told us ” 1% of cruising is spent with white knuckles on the helm, the rest you can enjoy” and I would have to agree. Captain Sailnator: What was your best/greatest sailing experience? Shannon: For me: honestly is when we have about 10knots of wind, the spinnaker up and dolphins at the bow. It happens a lot, and it is so great every time. For Jon: When ever the wind is aft of the bean and under 30knots, he is a happy camper. Sailing is his bliss. Captain Sailnator: Which destination/country/achorage did you like the most? Shannon: This is a tough question, there are so many anchorages! And each anchorage offers something completely different than the last. My all time favorite anchorage is still to this day San Siemon Cove in California. Could be just because I have such special memories there with my family, but the anchorage is just simply breathtaking. In Mexico my favorite would have to be Bahia Santa Cruz in Hualtulco. The water is clear,there is a ton of life in the water and the town is adorable. Jon: his fav in California is treasure island in San Francisco. His favorite in Baja California would be Hipolito. His fav in the Sea of Cortez is Mezteno at Isla Espritu Santos. And on the mainland, would be Bahia Santa Cruz as well. Captain Sailnator: Which destination is still on your bucket list? Shannon: The world is huge! We are really looking forward to the Las Pearlas Islands in Panama. We would love to see Europe, French Polynesia, the Caribbean! Gez it looks like we have some serious miles to sail! Captain Sailnator: How does a normal day on board looks like? Shannon: Normal day while at anchor: I sleep in, Jon makes coffee to wake me up. I make breakfast, we might watch a show while we eat. We then set out to do something, hiking swimming, shopping (for food, no room on the boat for “stuff”) or we might just simply stay aboard, read, edit videos, write blog or play games. Then there are work days where we spend the whole day doing boat maintenance. Well Jon pretty much works on the boat every day. 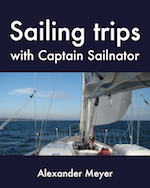 Captain Sailnator: How much of your time in percent do you spend sailing and how much moored? Shannon: I would say it is about 20% sailing, 78% at anchor and 2% in a marina. Captain Sailnator: How do you prepare yourself for a trip? Shannon: We pack the boat to where hopefully nothing will fall down or over, (this is something we still have not mastered down below) watch the weather, and possible ask around for anyone who has done the trip, is doing the trip the same time we are or has just done the passage to hear their strategy. Captain Sailnator: Where do you get information about the weather? Shannon: SSB nets, passageweather.com buoyweather.com eebmike.com and local forecasting. Captain Sailnator: How do you get information about the countries you sail to? Shannon: Guide books, noonsite, Jimmy Cornell’s World Cruising Destinations, Google, and word of mouth. Captain Sailnator: How do you navigate? Shannon: We have a Raymarine chartplotter with c-maps or Navionics vector cards. We have paper charts for all the areas we visit. We have navigation apps on our tablets, and multiple gps devices. We also use OpenCPN. Captain Sailnator: Wich questions are you asked most often? Shannon: How old are you? Followed by: How can you afford to cruise at such a young age? Captain Sailnator: What do you recommend to people who have the dream to cruise or to live aboard? Buy a boat for its offshore design, not for its looks. Know the difference between what has to be done before you leave, and what can be done along the way. There will always be projects that need to be done along the way no matter how new or pristine your vessel is. Captain Sailnator: Shannon and Jon, thank you very much for this very interesting interview. I think it is a good inspiration for others who have the dream to do a cruise like you. I wish you all the best for your trip and always fair winds. And may be one day we will meet each other – out there on the roaring sea! If your are a cruiser or liveabord and want to be interviewed too click here for further information!